Bulldogs still look strong in always-tough MVC. When the playoff seedings are settled in February, Madison Area Memorial High School will certainly look back at the first two games of the season as important wins. The Bulldogs opened the season with victories over Dirigo and Boothbay, two perennial Mountain Valley Conference contenders. 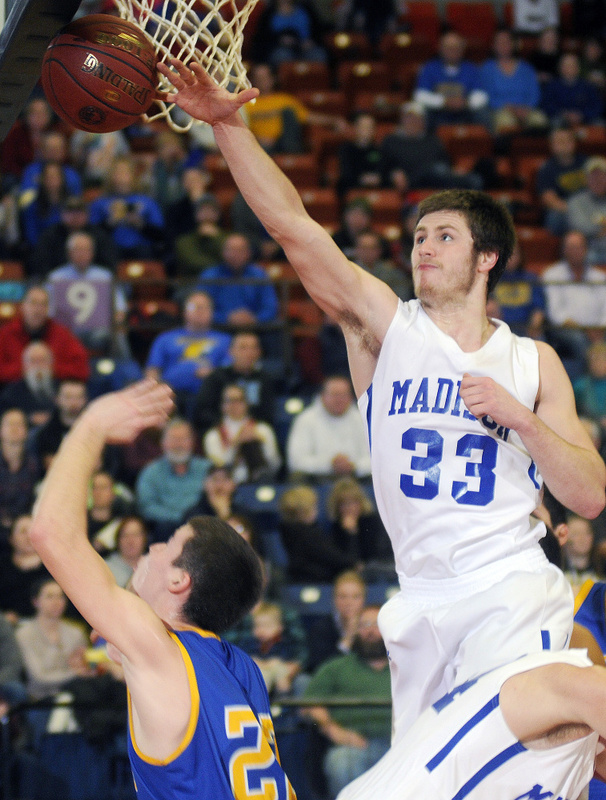 Madison won at Dirigo, 51-45, and followed up with a 58-50 win over the Seahawks on Tuesday at home. Coach Jason Furbush said the wins are big, because the Bulldogs didn’t play their best basketball in either game. Furbush said Madison had around 20 turnovers in each game, adding a degree of difficulty to the key wins. “I think both teams will win their fair share of games,” Furbush said. A key to each win was being aggressive, Furbush said. The Bulldogs attacked the rim and got to the free throw line. While Madison was just 15 for 30 at the line against Dirigo, it improved to 10 for 15 at the line against Boothbay. “We made more free throws than the other team took, and that’s big,” Furbush said. The Bulldogs have been balanced offensively, while junior guard Evan Bess has been the defensive leader. Junior guard Sean Whalen has played point guard and has done a nice job getting to the hoop, Furbush said. Forwards Matt Oliver and Max Shibley have given the team a spark on the boards. “No one’s stood out, but we’re playing well as a team,” Furbush said. Another team off to a good start is Nokomis. The Warriors opened the season with wins over Mt. Blue (48-33) and Lawrence (59-55). For a team that finished just outside the tournament last season, a 2-0 start is a stepping stone toward the postseason goal. Against Lawrence, Martin said the Warriors knew Mason Cooper would be tough to stop. So Nokomis dared other players to make shots, and they did. Brandon Hill and Connor Trask each made three 3-pointers for the Bulldogs. “They had a few kids step up,” Martin said. Nokomis had players step up, too. Jake Erskine’s 3-pointer with less than a second to play in the third quarter gave the Warriors a five-point lead heading into the fourth. Zach Hartsgrove scored a team-high 22 points, including four free throws down the stretch that helped ice the win. It’s all part of a new attitude Martin said he’s seen take hold of the Warriors. Curtis Miller had never coached before taking over Valley this season. So far, things are going well for Miller, who has the defending Class D state champion Cavaliers 2-0 heading into this weekend’s games against Vinalhaven. Miller, a 2008 Valley graduate, said the Cavs will continue to play the up-tempo style of basketball for which they’ve been known since Dwight Littlefield was winning six consecutive state titles from 1998 to 2003. “We’re going to get out and run. I have eight to 10 guys in the rotation and we’re running a lot,” Miller said. This weekend’s games against Vinalhaven are a good test for the Cavs. Like Valley, Vinalhaven is a contender in the East/West Conference and is 2-0 after a sweep of Forest Hills on opening weekend. “We’ll definitely be working on some defensive stuff,” Miller said. Around the state: In one of the oddest delays in a while, Tuesday’s game between Skowhegan and Brewer was held up for 40 minutes when the clock malfunctioned less than a minute into the game. When play finally resumed, Brewer took a 53-46 win, overcoming a 20-point deficit… This weekend’s trip to Valley is the start of 10 consecutive road games for Vinalhaven. Eight of those games will be overnight Friday-Saturday trips for the Vikings… Southern Aroostook scored 85 points in each of its first two games. It will try to keep the offense going on Monday when it hosts Fort Kent.